"The DVD goes through 10 current popular worship songs and teaches the keyboard, piano, synth , organ, electric piano, pad lines, and sounds for each. 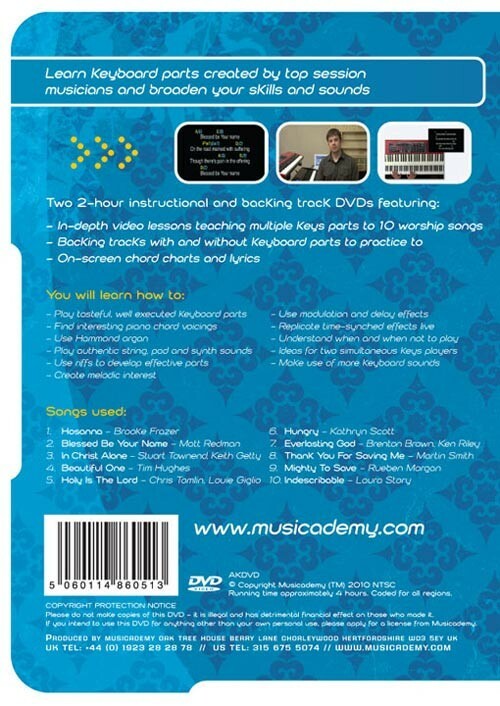 There are five songs on each DVD and each song is presented with a tutorial that goes through each keyboard part played in the different songs. Along with the tutorials, there are backing tracks provided. The first backing track includes all the keyboard parts, while the second backing track removes the keyboard parts for direct and immediate application for the viewer. 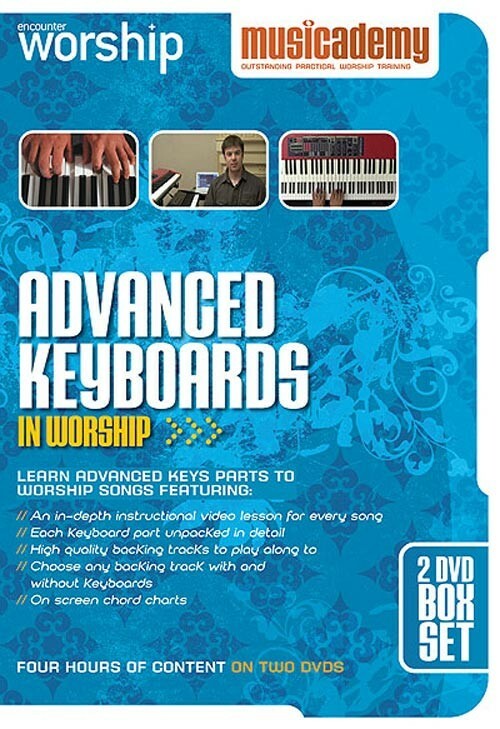 Each song tutorial is explained thoroughly and concisely with the backing tracks waiting for quick and easy practice....If you already have a good general knowledge of the sounds and functions your particular keyboard has to offer then this is a great find for you....the lessons you learn will transfer to just about any worship setting." For relatively accomplished players (i.e. 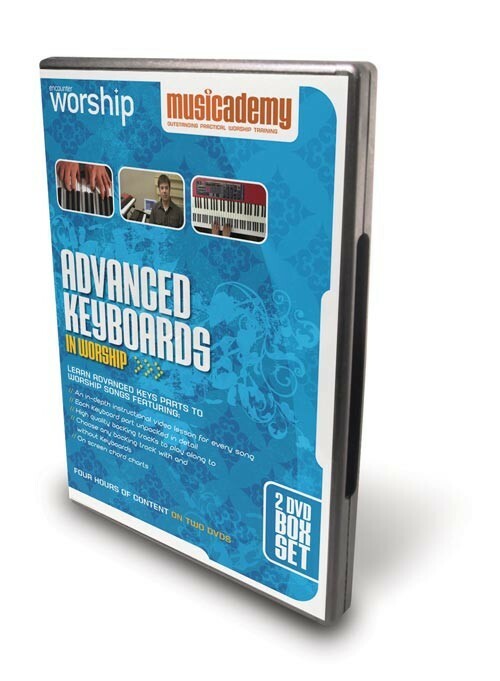 already playing regularly in a worship band using chords based playing) or those who have progressed through Musicademy's Intermediate Worship DVDs. The Advanced set is designed for people who have all the musical know-how from the Intermediate course but want to explore more about differen keyboard sounds. The Advanced DVDs unpack the multiple keys parts to 10 professional worship song recordings so that you can recreate those sounds in a live setting. I'm not sure how to rate but I will give some feedback. Advanced keyboard is a bit misleading because the content, I think, is for intermediary keyboard players. Your analysis of the song and the explanation about the layering etc was good. Did however expect more techniques / tips etc. I have however learned some new things. Thanks for the feedback. It's always tricky to know how to title these products. We call this Advanced because we really would recommend that people tackle the intermediate before doing this one. The intermediate shows all the techniques and tips I think you are looking for. The advanced is more to do with pushing the boundaries of the instrument in terms of sounds and effects. We unpack lots of professional recordings and show you exactly how to play those parts - that's pretty advanced stuff but not a "syllabus" such as the Beginners and Intermediate DVDs are. The product content is brilliant. 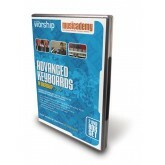 If you're an aspiring keyboard player, you absolutely need Advanced Keyboards in Worship. Unfortunately the DVD's won't play in any of the DVD players built into my MacBookPros or even my late model iMac. This was characteristic of the Intermediate Keyboards in Worship products that I purchased also. So I can't go 5 stars on ease of use. Thanks for letting us know about the DVD issue. 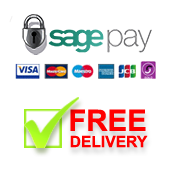 It works on our Macs here and also any PC or normal DVD player we use and this is not a problem we have picked up from other customers. They are coded for Region 0 so in theory should work anywhere in the world. Obviously we are happy to give a refund to anyone experiencing problems after purchase though. I have played piano for years at churches as a solo pianist. I recently join a worship band in a big church. They gave me both a piano and a keyboard, and expected me to play fluently on both. This series provide me with good information to start playing keyboard in a band. It also teaches me how to approach keyboard in different ways. I purchased the beginner, intermediate and advanced DVDs and learned much at how to expand my technique and learn how to break-away from playing 'traditional' piano accompaniment. I've searched and googled high and low for a training tool appropriate to playing keyboard - and this is it!! I highly recommend church worship teams have this in their resource library. Well done Musicademy! I have played piano/keyboards for years, but felt that I was in a rut. This DVD helped me in some very key ways. One of those ways was the tips in playing fills and finding new voicings to make my playing richer and more interesting. I could hear players doing that but could never quite figure out what they were doing. I am a visual learner, so the camera view above the hands helped me more than anything else I think. This is an excellent product that can improve your skills and increase your enjoyment of playing music! I highly recommend it! Im a drummer, but I did have a a 2 year piano/accordion background. For a while I was asked to play keys for a beginning youth band. I choose intermediate vs beginner DVD set, and it was great, having rhythm as a drummer, it was easy to jump on and continue with this DVD set, even though I am still a beginner piano player. I want to say that piano beginners with some musical background will greatly benefit. songs. It is so easy to fall into a rut and play songs with the same patterns, but these DVD's have helped me avoid that. Thanks for putting them together! Great tools. These guys know what they are doing. Watch the demo video and read the product description. Everything is there, explained and demonstrated. Two hours worth of stuff on each DVD. They even went through the trouble of putting the camera directly overhead so that you can see exactly what is being played, very helpful.